and Mike and Mona's Five Springs Farm, May 28, 2011. 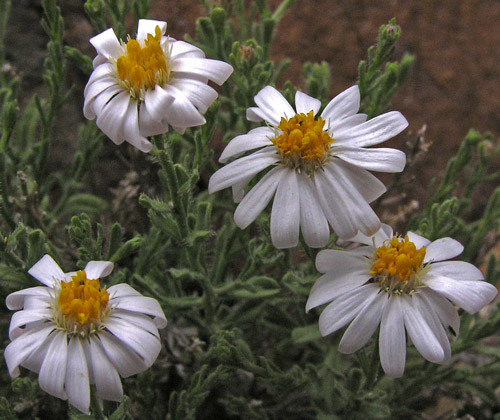 Chaetopappa ericoides is tiny, beautifully symmetrical, delicate, and bright. 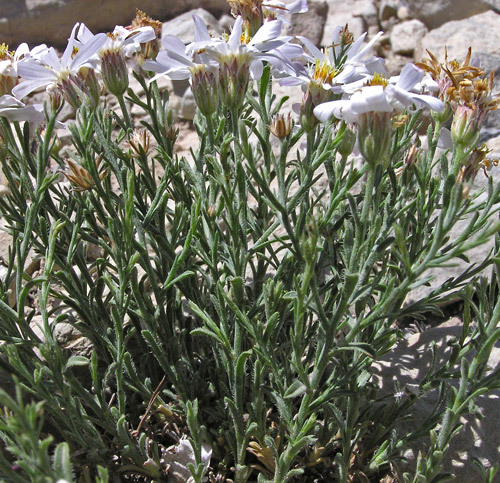 It spreads from roots and can be abundant on hot, semi-desert, sandy and rocky slopes, sometimes forming large clusters. Most often, though, it occurs scattered in small clusters, as in the second to last photograph on this page. Ray flower petals commonly curl downward in the evening and straighten by mid-morning. Disk flowers number from 12 to 25 and rays from 8-25 so the flower appearance can vary (as shown in the photographs on this page). Leaves range from 6-20 millimeters long and 1-2.5 mm wide and this range, especially of leaf length, produces plants with leaves so minute that they almost overlap as they are nearly pressed against the stems (as in the top photograph at left) and plants with a more open and airy leaf arrangement (as in the second photograph at left). 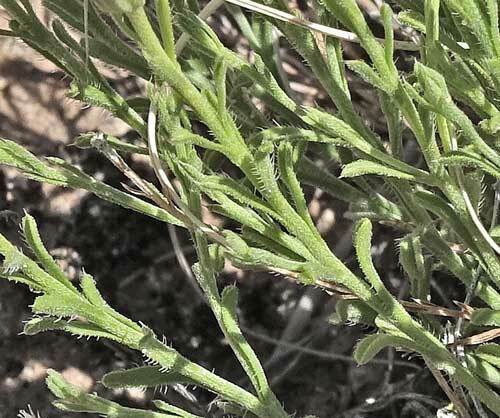 Leaves and stems can have a variety of hairs: strigose, glandular, and/or rough (hispid). See photograph below. Augustin de Candolle named this genus in the early 1800s. This species was first named Inula ericoides by Torrey in 1827 from a specimen collected by Edwin James "on the Canadian [River]" on the Long Expedition of 1819-1820. 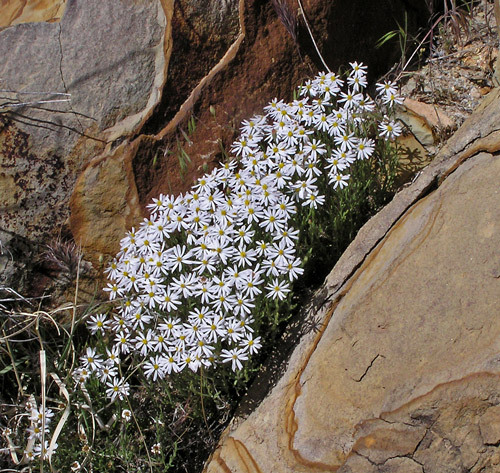 (Intermountain Flora quotation.) The species has since undergone more than a dozen name changes including Leucelene ericoides by Edward Greene in 1896 and Chaetopappa ericoides by Guy Nesom in 1988. 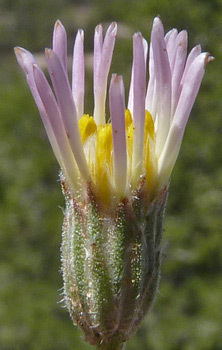 "Chaetopappa" is Greek for "bristly pappus". 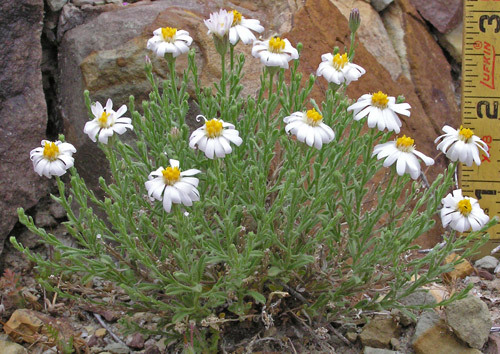 "Ericoides", also Greek, means "similar ("oides") to Heath ("eric")", i.e., the plant's leaves are similar to those of some Heaths. Ericaceae is the scientific name of the Heath Family. McElmo Canyon, Canyons of the Ancients National Monument, April 27, 2005 and Mike and Mona's Five Springs Farm, May 28, 2011. 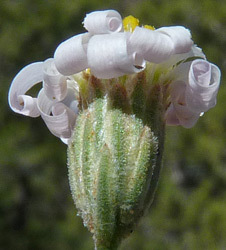 Mature flowers can look quite different from immature flowers. 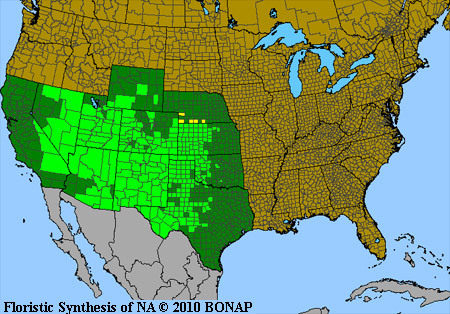 The Shiprock, New Mexico, May 7, 2007. 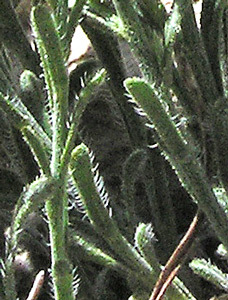 Leaves often have bristly hairs on their margins. McElmo Canyon, Canyons of the Ancients National Monument, April 27, 2007. Gateway, Colorado, May 11, 2012. 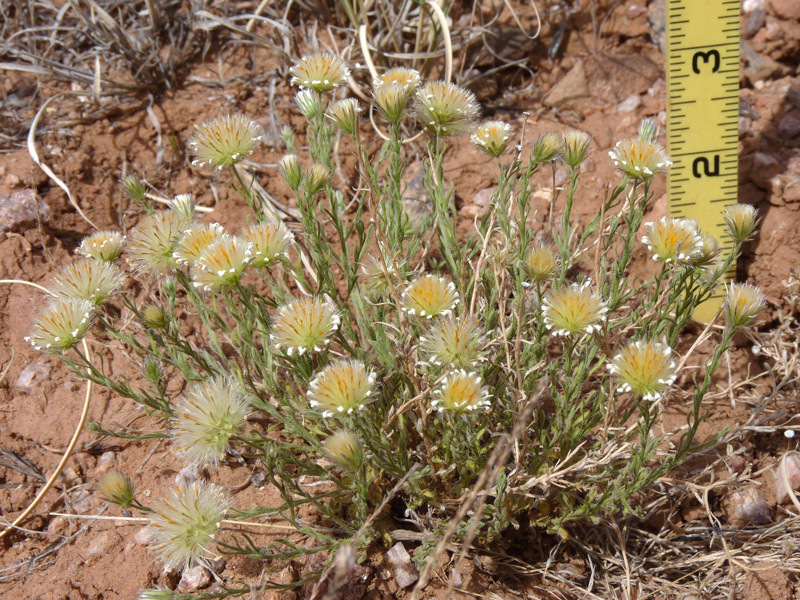 The first photograph above shows a typical distribution of C. ericoides. 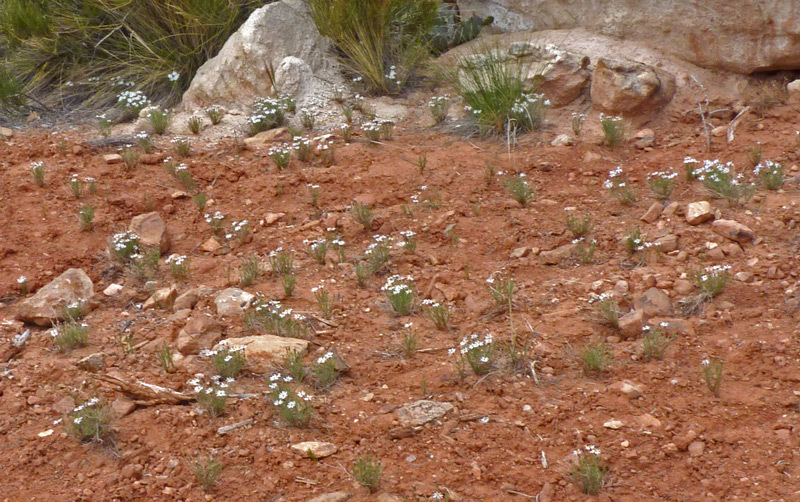 Such patches of the dainty white flowers are common from 5,000 to 7,500 feet in April and May. The second photo shows ray flowers shriveling to tiny white dots and a number of flower heads already in seed with the pappus hairs ready to float the seeds on the first strong winds.